Mekong Strategic Partners (MSP), in association with Seedstars World (Seedstars) Smart Axiata, and USAID’s Development Innovations, announced the launch of ‘SmartScale powered by Seedstars’, an acceleration programme for the most promising startups in Cambodia. SmartScale will start in May 2019 for a period of three months. Up to 15 promising Cambodian-based startups will go through on-site intensive training based on the Seedstars program structure. The program aims to improve product-to-market fit and to maximise customer interactions by leveraging knowledge transfer and receiving expert guidance. Two in-house, full-time entrepreneurs-in-residence, international investment professionals and more than 20 international and local mentors will be part of the program structure. The selected startups will have an opportunity to enjoy free working space in an inspiring environment, equity-free participation, support from local companies, weekly 1-on-1 meetings with entrepreneurs-in-residence and weekly content delivered by hands-on experts. They will also potentially receive follow-up investments of up to $100,000 USD from the Smart Axiata Digital Innovation Fund and the Seedstars investor network, as well as exclusive access to thousands of dollars’ worth of tech benefits such as Xero, HubSpot and Amazon Web Services. “We want to support entrepreneurs on their path to self-reliance, especially those who need greater mentorship from experts in the investment industry to acquire more customers, increase revenues and ultimately secure financing or investments,” said Kate Heuisler, chief of party of development Innovations. “Cambodia’s startup community has been yearning for such a program that will act as a funnel for more local startups to move on to the growth stage. 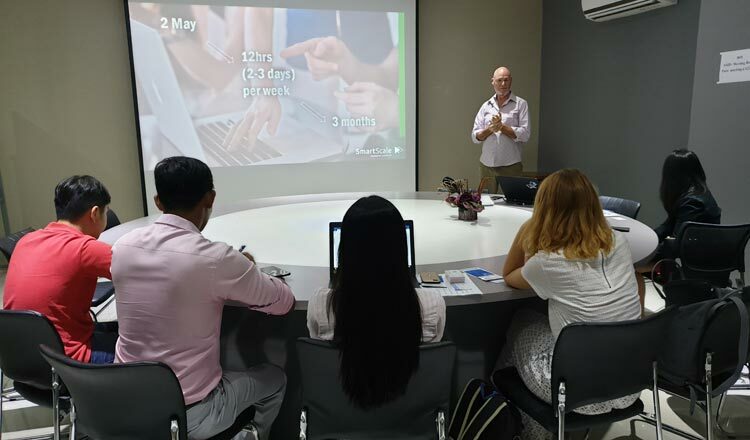 Smart is delighted that MSP with the support of Seedstars and Development Innovations, is piloting this new program which will be an important piece of the puzzle in Cambodia’s digital ecosystem journey. We hope to discover and scale the very best tech ideas of the Kingdom!” added Thomas Hundt, CEO of Smart Axiata. Smart advertising for iPhones in Cambodia.